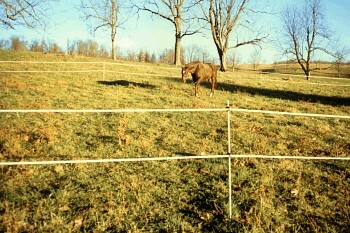 The FAST FENCE Trail Kit is a portable fence kit that is primarily intended for constructing temporary horse corrals on overnight trail rides. However, it is also suitable for controlling many other animals. This kit was designed with the help of experienced horse owners and agricultural university personnel. 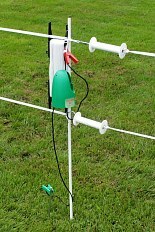 With the handy FAST FENCE Trail kit, overnight paddocks are simple and easy. It only takes about fifteen to thirty minutes to erect the fence or to dismantle and repack the kit, depending on the length and location of the fence. The F899 Trail Kit comes in a convenient zippered canvas tote bag and includes enough bright white fiberglass posts, Hot Tape, and accessories to set up a two strand fence that is 330 feet long and that is highly visible and very effective. F900 Kit also includes a portable fence charger. If an optional twelve more intermediate posts with insulators are purchased, then a single strand fence up to 660 feet long can be erected. The Trail Kit is designed to be simple, quick, and easy to use without unnecessary gadgets or loose parts. There is room for additional gear in the bag and it can be tied across the back of a saddle. The Portable B 6 Fence Energizer operates on two "D" cell flashlight batteries and easily fits in the tote bag. FAST FENCE Trail Kit - includes Posts, Drive Cap, Clips, Insulators, Hot Tape, Tape Storage Frame, Ground Rod, Gate Handles, Splice Buckles, and a Warning Sign in a canvas tote bag. To purchase above posts with insulators, enter a note to that effect in the Order Form "Comments" box.